Motorists, airline passengers and school districts can expect an early hit from Old Man Winter with snow, ice and rain set to cause disruptions over a large portion of the eastern United States prior to the end of this week. 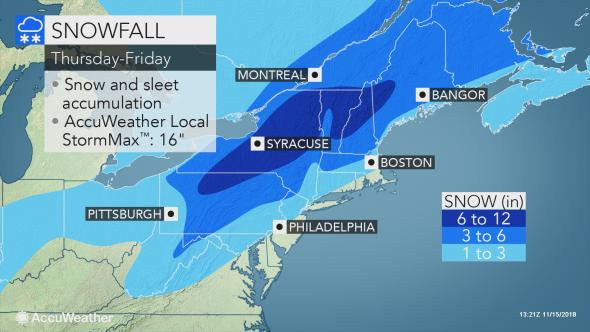 The storm, already producing widespread snow and icy conditions, will strengthen and sweep across the Northeastern states during Thursday and Friday. The same storm has delivered heavy snow and ice to part of the central U.S.
Download the free AccuWeather app to find out the start time of the storm and how much snow, ice and rain to expect at your location. 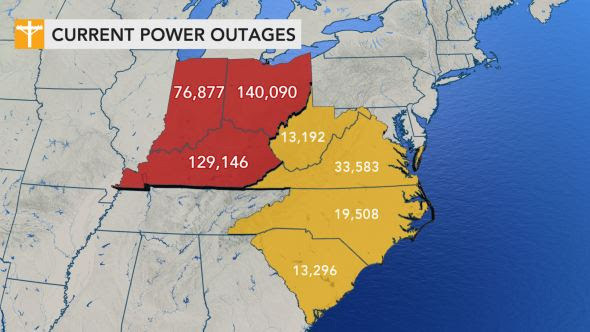 As of 11:30 a.m. EST Thursday, more than 500,000 utility customers were without power as a result of the storm, according to poweroutage.us. People living in or traveling through portions of Virginia, West Virginia, Maryland, Pennsylvania, New Jersey, New York and New England can expect dangerous driving and walking conditions. On Wednesday night, up to 0.50 inches of ice accrued on trees, powerlines and other elevated surfaces across portions of Indiana, Kentucky and Ohio, resulting in widespread power outages.